If you’re an elite sailing geek like me you may want to check out Thomas Colville’s solo round the world record attempt that’s happening right now on the trimaran Sodebo. After 20 days at sea he is only 5300 nautical miles from the finish and is a whopping 1600 nautical miles ahead of the current record pace. If he can just avoid hitting something he’s set to obliterate the solo round the world record in the next week or so. 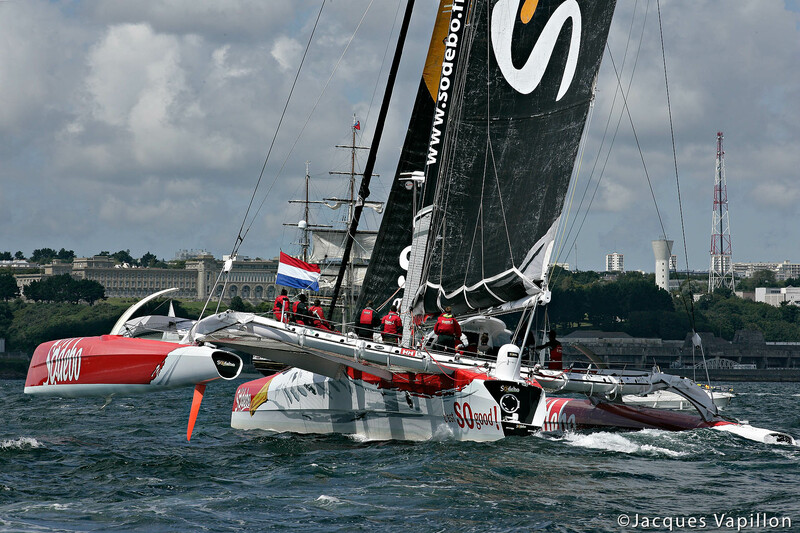 Trimarans have become the vessel of choice to smash sailing speed world records. There’s a very good reason too – unlike catamarans they are very good in the wind, and because of the laws of physics about waterline length and speed they outrun monohulls at every point of sail. You don’t have to sail a 100ft Maxi to destroy the fleet either – there are some very affordable cruising and dinghy tris out there too. Reflecting on learning to sail multihulls, we will have a blast around catamarans and trimarans in this blog. One of a few good reasons to sail a cruising cat is the space. With two hulls you will be in complete luxury by comparison to the monohull of equivalent length. They are in a different league when it comes to luxury! There has been debate as to what’s the best boat to sail for years. Until the flying America’s Cup boats started touching 30 knots upwind, catamarans were universally derided for their upwind performance. Someone who has learned to sail in monohulls will immediately notice the leeway on cats. They rely on stability from digging their leeward hull in the water yet few have daggerboards that go deep enough to prevent them sliding sideways on a beat. Monohulls rely on stability through the weight of their keel and while far slower they will sail closer to the wind with far less leeway. OK, so while the monohull will be able to sail closer to the wind, and in a gale will be able to make progress long after the cat sailor has given up, the cat has one characteristic that blows monohulls out of the water – they are blisteringly fast! Even on a chubby, under-canvassed cruising cat you will out-sail a monohull of equivalent length on a broad reach or a run. Sailing to the cat’s strengths you may be able to beat the monohull on an upwind course too, as you cover longer distances in shorter time, so can lay off more and take bigger tacks. This isn’t just a theory – the cats at my old sailing club did this all the time and always outran the fleet. If you have never sailed a cat before yet are attracted by the space in a cruising cat or the performance of a dinghy cat (such as a Dart or Hobie) it is important to do a catamaran conversion course. One example of why is when the wind picks up on a yacht. On a monohull you will lean over a lot in a building wind and immediately start thinking of taking in sail. If you’re too slow you could be knocked flat but generally you will recover. On a cruising cat you will start going faster and faster and if you’re not switched on could flip. You won’t self-right unlike a monohull. If you are interested in speed, in most sailing conditions trimarans are a better answer than the other two above. You are almost as good upwind as a monohull, have more waterline length, so your Froude numbers are higher and you will naturally go faster. You are more stable than a mono too. The downside is space – this is similar to the mono, though obviously the deck area can be a lot larger! 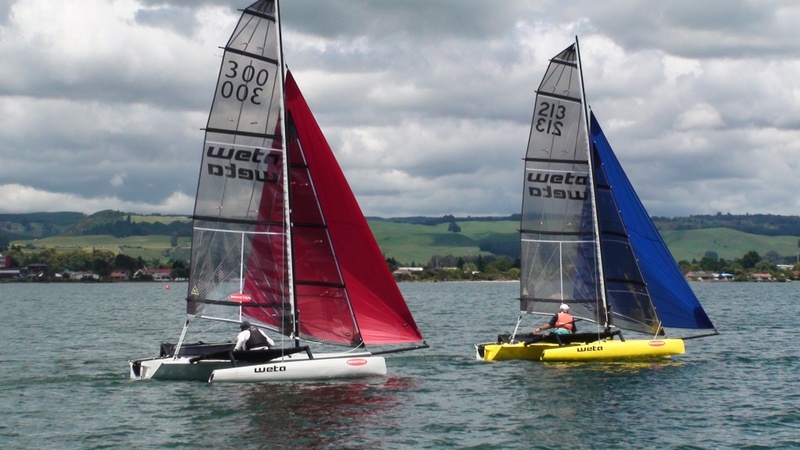 For these reasons I know a boat that I am after – the Weta trimaran dinghy. Few dinghies sail on apparent wind unless you’re getting to expert level. The fastest one of these has been is over 20 knots! I’m getting on a bit – I’m in my early 40’s and need something I can self-launch yet has the space for my young family, none of whom will be much help in getting it back onto a trailer. The Weta is much lighter than a Wanderer or a Wayfarer, yet has far higher performance than those old bricks. They are very new and to my knowledge there are about two on sale second hand in the UK – I may end up buying new from their factory in New Zealand. Just need a pay rise or two as they cost about £10,000! Again, with tris you need to learn to sail them and this requires a conversion course. When it comes to cat dinghies you can quite easily right them. Tris aren’t so easy. Even so, I have written to Santa Claus and asked him for a trimaran. Who knows? He might appear sometime during the Spring with one for me – better late than never!